SAN FRANCISCO, June 4, 2013 -- San Francisco State University announced today the appointment of Ronald Cortez as Vice President and Chief Financial Officer, Administration and Finance. 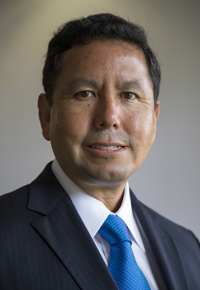 With more than two decades of public sector administrative and financial experience, Cortez currently serves as the associate vice chancellor for administrative services at the University of California, Santa Barbara, a position he has held since 2008. He previously worked for fourteen years for Santa Barbara County, the last three as deputy county executive officer. "Today's universities face a number of challenging opportunities and must sustain a complex set of relationships to many constituents," said President Leslie Wong. "Mr. Cortez brings a skill set that will ensure San Francisco State University's relationship to our students and the citizens of California, as well as enhance the University's participation in the very strong local economy." He will begin his tenure at SF State on July 2, taking over from Nancy Hayes, who in 2011 was appointed to the position on an interim basis after serving as dean of the College of Business for six years. In recognition for her service to the University, Hayes was awarded the President's Medal at SF State's 112th Commencement exercises on May 25. "The University will be able to transition from an exceptional leader in Nancy Hayes to another exceptional leader in Ron Cortez without missing a heartbeat," said Wong. At UC Santa Barbara, Cortez directed the implementation of a new financial, e-procurement, timekeeping and payroll system. He led negotiations on behalf of the University with the County of Santa Barbara Sheriff's Department and Fire Department, providing police, fire and paramedic services for the campus' long-range development plan. Cortez was also awarded a statewide award for higher education-local government collaboration in the area of sustainability. Under his leadership, UC Santa Barbara's risk management and liability program was named the best in the ten-campus UC system for four consecutive years. As deputy county executive officer for Santa Barbara County, Cortez supervised a department of 1,200 employees with a $225 million operating budget and $100 million capital budget. Based on community input, he reorganized the county's planning and development department to improve its performance while cutting costs. He also directly oversaw the construction of more than a dozen county buildings. As the University's vice president for administration and finance and chief financial officer, Cortez will oversee a budget of approximately $450 million and provide strategic and operational direction for the University's nine business departments. They include budget administration and operations; the division of information technology; fiscal affairs; human resources, safety and risk management; internal audit; physical planning and development; campus space administration; capital planning, design and construction; facilities and service enterprises; and University property management. Cortez earned a bachelor's degree in business administration from San Jose State University, a master's degree in public administration from Northern Michigan University, a master's degree in organizational management from Fielding University and a law degree from Santa Barbara College of Law. SF State is the only master's-level public university serving the counties of San Francisco, San Mateo and Marin. The University enrolls nearly 30,000 students each year and offers nationally acclaimed programs in a range of fields -- from creative writing, cinema and biology to history, broadcast and electronic communication arts, theatre arts and ethnic studies. The University’s more than 219,000 graduates have contributed to the economic, cultural and civic fabric of San Francisco and beyond.